This traditional Alutiiq (Russian-Aleut) village was located on the south coast of Afognak Island, north of Kodiak Island. It lies at approximately 58° 00' N Latitude, 152° 46' W Longitude . The community is located in the Kodiak Recording District. The area encompasses 0 sq. miles of land and 0 sq. miles of water. The village name was derived from Afognak Island, and was first reported in 1839 by Sub-Lt. Mikhail Murashev. The Census of 1890 noted a series of settlements along the beach, including Rutkovsky village, a group of retired employees of the Russian American Company. A post office was maintained intermittently from 1888 to 1958. The Good Friday earthquake of 1964 generated a tsunami which destroyed the village. 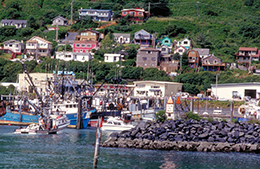 A new community was constructed on the northeast coast of Kodiak Island, called Port Lions, and the residents of Afognak moved there permanently in December 1964.